I tell myself that I love teaching, in theory, I get summers “off”! But I realized recently that I have not taken a summer off in over 12 years! Some may ask why have I consistently worked during the summer? To be honest, the money is pretty good, since it’s my hourly wage without being divided over 26 paychecks. I work half days and make the same amount as a regular paycheck. The days are short, having just four hours at a time with students, four days a week. In addition to the pay, know myself- If I don’t keep busy, I will sleep until 2 pm, stay up until 4 am, eat too much, Netflix binge, and lose all my self-discipline! But in all honesty, there is something different about teaching in the summertime that restores my teaching sparkle. It’s a more relaxed environment than your typical school year. One example of this is our research project that spans the summer. Currently, my students are creating a book about a marine animal. They are researching, reading with a purpose, and writing about a topic that they are learning to love! Most of all, though, students bond with you quickly and it feels so worthwhile, which is a feeling that can get lost during the regular school year, with it’s frequent assessments, deadlines, and routines. 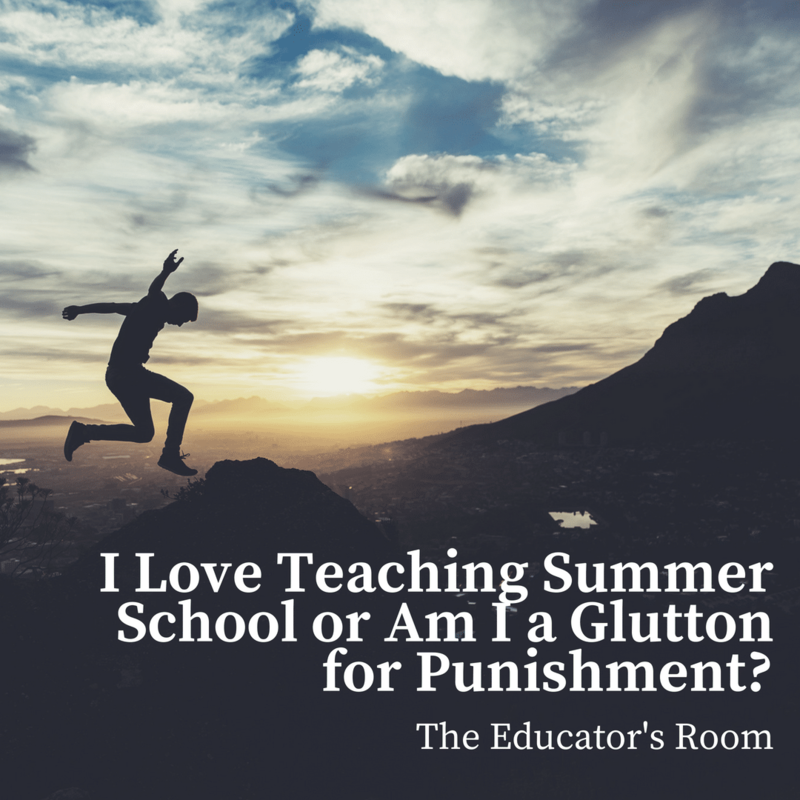 So why are my students in summer school? In Florida, if a third grader does not score a level 2 or higher on the Florida Standards Assessment (FSA), they are automatically retained. The only exemption is for students who are ELL and are in their first year in the country. The students scoring level 1 must attend an extended school year (ESY). They can work towards a portfolio to demonstrate independence in the standards or they can score at or above the 45th percentile on the SAT10, which few rarely do. These are the only ways for fourth grade promotion once the FSA is failed. So my students end up in “summer camp,” designed to help them love reading and improve their skills. That’s how I find myself teaching summer school- year after year. So in an effort to keep students engaged, the powers-that-be have determined that the best way to grab the students’ attention and motivate them to get up early on a hot, July beach day is to have them become marine biologists. The students will read and write about a particular marine animal. We “scream the theme” in the classroom decorated with orca and sea turtle floaties around the room. Bulletin boards are covered in “seaweed” and rainbow fish cut from the paint strips from the paint store. I know that as teachers, we spend tons of money on our own classrooms. By recreating my style in the marine theme, I have found many teachable moments have occurred for students based solely on the room’s decor. Armed with blow up animals and a reef made from pool noodles, I embarked on the under the sea expedition with these students in an attempt to learn to love reading! Another perk of my summer this year has been training my friend’s daughter. She wants to be a teacher, so she is trying it out with me. She learns quickly and has a natural way of bonding with students that is incredible for a new teacher! Our students are not only challenged learners, but they are from a rough neighborhood in a Title I school with issues that poverty bring. Most teachers do not adjust as quickly and successfully as she has, and she is like a fish in water! She has taken initiative to learn the curriculum and make things on her own for the classroom. It’s been amazing to watch her learn and nurture her in the craft! I highly recommend becoming a mentor, if at all possible. Summer is the perfect time to train or mentor another teacher because of the freedoms allowed. There are no administrators in the room regularly, so the newbie can feel free to make mistakes in a less strenuous environment. The learning goals and deadlines are different as well. The schedule allows you to focus on learning to love reading. It reminds you of the reasons you initially went into teaching and helps you relight your spark! Your spark is showing, and this will even more fully inspire the new teacher as well. Despite my previous comments, summer school is not without its trials. The behavior of students who do not want to be in school in June and July can be challenging. The teacher’s job is to motivate them to come back daily and love it! Because my students are here for failing a test, they are already challenged learners. Many times, students will act out because they would rather look “bad” than “dumb.” It would seem that being smart is far more important than students would allow us to know. Academic frustration is the primary cause of the off-task and disruptive behavior. So my kiddos find themselves on point sheets for behavior, in addition to the academic tasks, core curriculum, and make-up growth we throw at them. I’d be frustrated, too! If you decide to teach summer school it is going to require strength on your part. If you are that teacher who has lost the spark, the inspiration or find yourself questioning your career, this may just be what you need to revive yourself. Getting up on a hot July morning and making myself work, knowing it was optional, is difficult; I’m not going to lie. But my mental health and my thought processes are healthier in general when I have a routine. Some of you who can hang out at home, set a good schedule, and actually stick to it, well, you people are my heroes! I know what I need, even if my body rebels EVERY SINGLE morning! We talk often about teacher’s mental health, how to maintain it, and it seems strange advice to suggest teaching summer school! However, as someone who has been in and out of the classroom as support staff for the last few years, I can tell you that this experience has renewed my spark. I will be back out of the classroom next year as a literacy coach and have deliberate plans to interact with students next school year so that I don’t lose this spark again! Perhaps I can sell you on teaching summer school next year. Perhaps I will scare you off! But for me, this opportunity to have a quiet campus and focus solely on reading is delightful! Working in a room that screams marine life is tremendous fun! Watching this young lady teach for the first time warms my soul! The bond I have so quickly formed with these students is heartwarming. And my budget, waistline, and mental health are all thanking me for not losing all my self-discipline; but you better believe I nap every day from 2 to 4 pm! Your experiences may not match mine, but hopefully, you will grow personally and professionally from the experience, as I have!